A couple of days ago, the first poster for the last Harry Potter movie was released. I thought it was awesome in its simplicity. 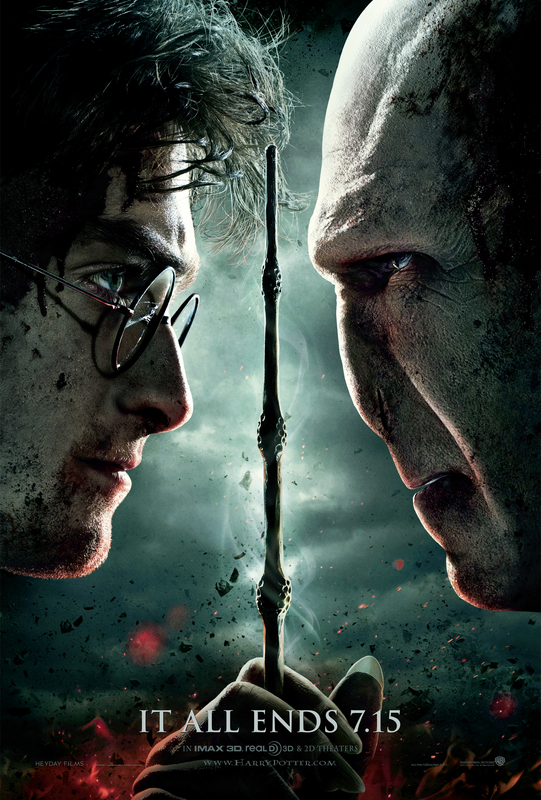 Harry facing off against Voldemort with only the Wand of Destiny clenched between them. However, can you think of a more cliched article of fantasy writing than the wand? What witch, warlock, mage, or sorcerer would not be properly attired without the final touch of this powerful weapon, whether it be a traditional stick of wood or a staff of power...or perhaps even a light saber. And if you're a writer of fantasy or paranormal, you have probably worked a wand of some sort into your own manuscript. But as writers, we seek to always bring something new to whatever we create. And breaking out from old cliched devices is incredibly essential to giving our reader OUR fresh perspective. JK Rowling does exactly this with her creations, even when they come from traditional lore. We can learn a lot about putting a fresh spin on an overused device by what she does with her magical wands. From the very beginning we learn that "the wand chooses the wizard." Not the other way around. Wands have their own lore, their own power, their own loyalties, and another's wand will not give you the same results as the one that chose you. Each wand is unique in its craftsmanship, like the owners they choose, and the wand's maker, like Ollivander, take great pride in their craft and remember every wand sold. As the series progresses, we see hand-me-down wands, broken wands, brother wands, dueling wands, and spells that tell a lot about wands, such as priori incantatem. With each of these examples scattered throughout the series, the reader's knowledge of the unique place wands have in this world grows. Thus, JKR prepares her reader for the final showdown and the most important wand of all. Since ancient times, sticks of one sort or another have been used as symbols of power and authority over people. From Pharaoh's was to Moses' rod, to a royal scepter, to the Pope's papal staff -- what person can hold power without brandishing a stick of some sort? Do we imbue these wands with power because of ancient images of a shepherd's guiding crook, or the disciplinary rod of a father over a child? Or perhaps they go back even further in our collective memory and hint at a primordial time when the holiest of places, the highest authority, was found in a grove of trees? Whatever the reason, sticks of wood convey authority and power and JKR used this to her full advantage, with her own twist, in the final book, Deathly Hallows. The Elder Wand that Harry and Voldemort both seek to claim, the symbol of protection against death, lies in a sacred tomb that Harry refuses to disturb, but Voldemort violates. It is this attitude that no one matters besides me, contrasted against Harry's self-sacrifice for the love of others, that is ultimately Voldemort's undoing. No totalitarian authority is allowed to live forever when those oppressed finally are roused to rebel. Not even the Deathstick, that magical ultimate weapon of mass destruction, can save Voldemort from a simple boy's kindness of heart. For it is Harry's nonviolent disarming of his classmate Draco which has won the loyalty of the Elder Wand. And it is his casting of a non-lethal spell into the face of Avada Kedavra, that turns the killing spell back onto its caster, and bring the end to He-Who-Should-Not-Be-Named. Recent events in the MiddleEast have shown what Voldemort learned too late -- even in the real world we witness that how ruthlessly a ruler wields his wand of power is often an indication of how brutally he will be brought down by those who've suffered under him. Writers -- Look at your symbols, your cliched items of your genre. What fresh spin can you bring to the tired symbols and tropes? Think deeply about your story, your world, your hero, and your meaning. Are your themes reflected throughout? And if not, what can you do to weave your own Wand of Destiny over your creation and make it truly come alive and sing with your Voice? Just a short post to point your way to a great analysis on Literary Rambles that I just discovered by S. Kyle Davis. He analyzes JKR's plot chart from Order of the Phoenix for writers, and does a great job of it. Mad-Eye and Frankenstein: A Monstrous Introduction! Mad-Eye Moody is one of JKR's most fascinating characters, even in GoF when he is basically an impostor. The reader first hears about Mad-Eye a chapter before he is brought onstage, through the varied opinions of other characters. Using the positive and negative (and sometimes false) opinions of others is a great way to lay the foundation and reputation of a new character. "Mad-Eye Moody?" said George thoughtfully, spreading marmalade on his toast. "Isn't he that nutter -"
"Your father thinks very highly of Mad-Eye Moody," said Mrs. Weasley sternly. "Yeah, well, Dad collects plugs, doesn't he?" said Fred quietly as Mrs. Weasley left the room. "Birds of a feather. . ."
"Moody was a great wizard in his time," said Bill. "He's an old friend of Dumbledore's, isn't he?" said Charlie. "Dumbledore's not what you'd call normal, though, is he?" said Fred. "I mean, I know he's a genius and everything.. ."
"Who is Mad-Eye?" asked Harry. "He's retired, used to work at the Ministry," said Charlie. "I met him once when Dad took me into work with him. He was an Auror - one of the best. . . a Dark wizard catcher," he added, seeing Harry's blank look "Half the cells in Azkaban are full because of him. He made himself loads of enemies, though. . . the families of people he caught, mainly. . . and I heard he's been getting really paranoid in his old age. Doesn't trust anyone anymore. Sees Dark wizards everywhere." Notice how JKR uses motherly corrections from Mrs. Weasley to highlight George's comment that Mad-Eye is a nutcase. Through this preliminary work, JKR lays the base for Dumbledore's trust of Mad-Eye and an excuse for Mad-Eye's extreme paranoia that will be shown throughout the book. Still, she uses Fred and George -- who in their role of tricksters have the remarkable ability to view their world outside the status quo -- to question whether Mad-Eye is truly all right and to plant a thread of suspicion upon him. A man stood in the doorway, leaning upon a long staff, shrouded in a black traveling cloak. Every head in the Great Hall swiveled toward the stranger, suddenly brightly illuminated by a fork of lightning that flashed across the ceiling. He lowered his hood, shook out a long mane of grizzled, dark gray hair, then began to walk up toward the teachers’ table. The lightning had thrown the man’s face into sharp relief, and it was a face unlike any Harry had ever seen. It looked as though it had been carved out of weathered wood by someone who had only the vaguest idea of what human faces are supposed to look like, and was none too skilled with a chisel. Every inch of skin seemed to be scarred. The mouth looked like a diagonal gash, and a large chunk of the nose was missing. But it was the man’s eyes that made him frightening. One of them was small, dark, and beady. The other was large, round as a coin, and a vivid, electric blue. The blue eye was moving ceaselessly, without blinking, and was rolling up, down, and from side to side, quite independently of the normal eye - and then it rolled right over, pointing into the back of the man’s head, so that all they could see was whiteness. The stranger reached Dumbledore. He stretched out a hand that was as badly scarred as his face, and Dumbledore shook it, muttering words Harry couldn’t hear. He seemed to be making some inquiry of the stranger, who shook his head unsmilingly and replied in an undertone. Dumbledore nodded and gestured the man to the empty seat on his right-hand side. All in all, a great introduction of an awesome character. But where to begin to analyze this? JKR just throws out so many well-crafted details, many of which point to clues to Pseudo Mad-Eye's ultimate purpose in this story. 1) Words like "shrouded," "limped," "speared," "unsmiling," "undertone," and "darting" cloak Mad-Eye as a man of mystery, action, and distrust. 2) This lack of his trust of others is reiterated with actions such as his eye rolling all around, into the back of his head to study everyone and everything around him, sniffing his sausages, his unblinking, always wary eye, and even the dull echo of his clunking gait across the floor, which hints at his tremendous losses, both physical and emotional. 3) Notice the wonderful, vivid descriptions such as "carved out of weathered wood" -- not just any wood. That weathered helps the reader know, this man has been through a lot. That "long mane of grizzled, dark hair," also lends to his crusty personality. Add to that the diagonal gash for a mouth and the nose minus a few chunks and you've got yourself a fabulous description that portrays a man who, using one of my father's expressions, has been "run hard and put up wet!" With the extreme care which JKR has used to introduce this character, the reader should know that this man is important to this story. Put all these parts together and you've got a most unusual man, a man who's seen the dark side of life, faced physical harm, distrusts must everyone around him, but a man whom Dumbledore trusts and welcomes brightly. Notice, however, that JKR does give a couple of hints toward this character's ultimate end -- that "fork of lightning" above his head is no accident. To fork is to divide into two or more branches. Pseudo Mad-Eye as impersonated by Barty Crouch is definitely a divided man. Perhaps a stronger hint are the "eyes that made him frightening." If eyes are the mirrors of the soul, then this man's "small, dark, and beady" and unblinking should strike fear into the heart of the reader! But perhaps the greatest clue of all is the subtle hint of a literary metaphor at work here. Do you get the feeling that Mary Shelley might have had an influence in the creation of this Frakensteinesque Auror? What with the flashes of lightening, the hints of an inept creator, and the scars and mismatched eyes that make it appear as if Mad-Eye was put together from various other people (as indeed Pseudo Mad-Eye was!). Shelley's monster was abandoned by his father-creator, turning him into a murdering, lost son -- much as Barty Crouch Jr. was. Indeed, at the end of Shelley's work, when the monster Frankenstein created and abandoned, nameless, tells his tale of woe, one feels more sympathy for him than for his creator -- as I felt myself for Crouch Jr. as well. Combine the forked lightning and shifty eyes with the hints of a Frankenstein created monster and Geroge and Fred's earlier banter that hints at distrust, and the reader should definitely be looking beneath this stranger's shrouded cloak into his mysteries. With these subtle clues, reader you have been warned. "CONSTANT VIGILANCE!" Even for the man who will soon teach Harry this crucial lesson in class. As writers, we introduce characters to our readers all the time. Many require straightforward weaving of description with action that bring that character to life. But a few will challenge us to use our highest skill. Those characters that must fool our reader for a time period, we must pay particular attention to. While it is ok to play sly and fool your reader, you don't want to outright deceive them unfairly. Clues, as subtle as possible, must be present, even from a character's first introduction. 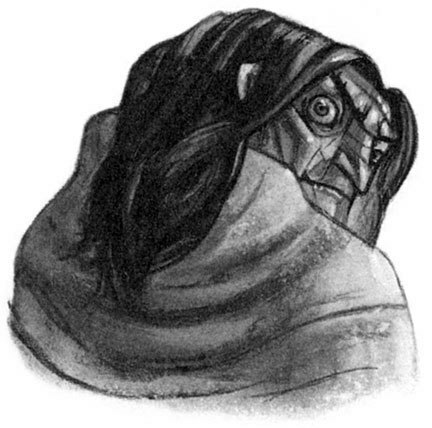 Through the use of a subtle literary metaphor, opinions of others, and shifty eyes, JKR gave a hint to the alert reader that all was not what it seemed with Mad-Eye, while at the same time presenting him as a man whom Dumbledore trusted, a wounded her, and an altogether fascinating creation. I'm curious to know -- what did you all think of Mad-Eye when you first met him? Were you alerted? Were you fooled? At what point had you figured out he was the prime antagonist? You may also be interested in my post about the link between Mad-Eye's magical eye and the Eye of Horus. As I try to develop my blog more, I'm looking for a few things/people that I hope you all may help me with. 1) I'd love to have more writers who are also Harry Potter fans to be willing to guest post. An initial post on how Harry Potter or JK Rowling has influenced you or your writing would be great, but could open up beyond that in the future, as long as it fits with the blog. 2) I'd love to connect with more fan artists who would be so generous as to let me use some of their Harry Potter fanart on the blog. 3) I'd like to know about more blogs out there that examine Harry Potter either as literature or for writers like we do here. Or just to connect with other great fan and writer blogs. 4) Any questions for the blog -- is there a topic you'd like me to cover? A technique JK Rowling uses you'd love to have analyzed? I'd love your suggestions. Thanks for any ideas you can give for any of these points! The Hero’s Journey and its Call to Adventure is a concept described within Joseph Campbell’s groundbreaking The Hero With a Thousand Faces. A comparative mythologist, Campbell studied myths separated by continents, centuries, and cultures and discovered that most shared a basic framework, the Hero’s Quest, which he broke down into 17 steps. Christopher Vogler, a scriptwriter and film producer, simplified Campbell’s work into 12 steps in The Writer’s Journey, making it more accessible to writers and the film industry. Campbell’s and Vogler’s Journey have been used in storytelling in everything from Star Wars to About a Boy to Harry Potter to insertyourowntitlehere. This monomyth is a universal pattern of story structure that transcends human boundaries to bubble up in myths from ancient Greece, to medieval courtly romances, to today’s commercial fiction. To put it simply--the Hero’s Journey is the story plot which has lasted the longest because it strikes a basic, universal human chord of truth. The first real step of the Hero's Journey, after setting up the ordinary world, is the Call to Adventure--the catalyst or trigger that gets the story rolling. The Call to Adventure prompts the heroine to leave her Ordinary World for the Special World. It could be something that threatens the peace of the Ordinary World if the heroine does not go off to deal with it. Each of Harry’s calls to adventure also directly reflects the primary focus of that book’s story. 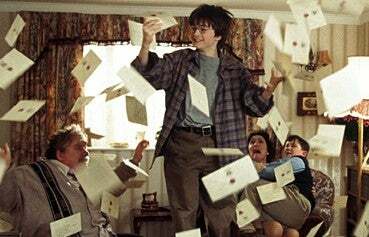 PS/SS--Letters from Hogwarts -- the letters signify Harry’s initiation into Hogwarts and the wizarding world. 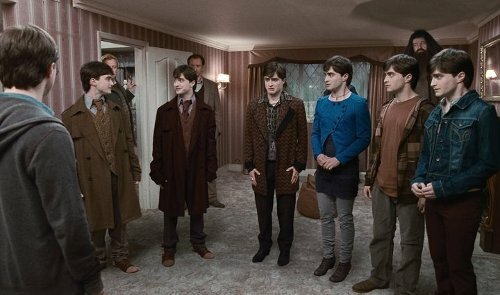 DH--The seven Potters -- the sacrifice Harry’s friends are willing to make for him by drinking his Polyjuice is directly reflected in the self-sacrifice Harry will make for them all in the end. It's lovely when a call to adventure at the beginning of a story can set the tone for what is to come and hint toward the resolution as well. Of course, the call should intrigue the reader and provide a strong hook to what is to come. What have you used as a call to adventure? How has it reflected your central theme or conflict? While I know I'll watch this movie when it airs and eat-up anything on JK Rowling, I have to wonder how good or accurate this will be considering what a private life she leads. Still, it shows what a fascination JKR still holds over the public's imagination -- even though the last book of Harry Potter was released almost 4 YEARS AGO! So, what do you think? Will you watch it?